Is Lunarpages a good web host? Find complete Lunarpages review plus latest Lunarpages coupon code here! - Get 35% off, use coupon code aff35off! 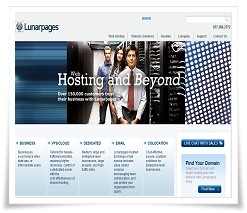 Founded in 2000, Lunarpages is a leading web hosting provider of affordable web hosting services worldwide. You will get the first hand and insider review from us on Lunarpages because this website is hosted on Lunarpages. Why are we one of the many customers of Lunarpages? This is mainly because Lunarpages provides reliable web hosting experience and excellent customer service & support. Their top rated support staffs and fast response had produced many satisfied customers and we are just one of them! Even though the Lunarpages Basic Plan (Personal Website) price is only US$6.95, this hosting plan provides many superb hosting features to be discussed below. Lunarpages's Basic hosting plan offers unlimited disk space and bandwidth. To put that into perspective, assume that each web page (HTML files and images) is approximately 50K in size, you can store approximately 20 million static web pages for 1,000 GB disk space. If each web visitor reads an average of 20 web pages (i.e. 1000K), then you will need to attract about 10 million web visitors to your website per month in order to use 10,000 GB bandwidth! To take advantage of the unlimited disk space and bandwidth, you can now host unlimited domains with a single Lunarpages account. In other words, you can operate unlimited unique websites with different domain name under just one Lunarpages account at only US$6.95 per month. All websites simply share the resources provided by Lunarpages. The multiple domain feature alone can cut down your hosting cost drastically! Fantastico Script Library - The Fantastico Scripts Library is a collection of 37 popular scripts that can be auto installed directly from the control panel. And some of the example of the scripts that you can add into your website immediately are WordPress, b2evolution, Mambo, Geeklog, phpWCMS, phpBB2, PHPSurveyor and more. Free Domain Name - The Basic plan hosting account includes a FREE domain name. Lunarpages will offer a free domain name (.com, .net, .org, .us, .name, .info, .biz), or you can transfer your existing domain from your registrar to Lunarpages and you won't pay a dime! e-Commerce Ready - If your online business needs to accept credit cards to boost sales and income, you'd be glad to know that Lunarpages's Basic plan is eCommerce ready. It supports up to three e-commerce system: osCommerce shopping cart, Cube cart shopping cart and Zen cart shopping cart. Here is a live showcase example running on Zen Cart. You can install your choice of shopping cart directly from the control panel. In additional, the Basic plan also provides a shared Secure Sockets Layer (SSL) certificate for online payment. The Lunarpages's system is fully compatible with the Authorize.net Payment Gateway system. All these e-commerce features comes free when you sign-up with Lunarpages. Unlimited Add-On Domain - With the Add-On domains features, you can now run multiple separate websites within one account. Lunarpages's Basic plan customers now have unlimited free add-on domain. In other words, you can run up unlimited different unique domain name websites on just one Basic plan account! Control Panel - Lunarpages used to support CPanel control panel, however, they developed and deployed their customized control panel 'Alpaca' on June 2009. We like the new Lunarpages's 'Alpaca' control panel as it is user friendly, with intuitive interface using simple icons, it will certainly help to simplify your website administration job. Lunarpages is renowned for its' superior customer support. From our point of view, Lunarpages will be an excellent choice if you are new to website hosting and you expect to request a lot of technical support or service in the foreseeable future. With more than 100 staff members worldwide, you can always receive fast and friendly responses from Lunarpages. 24/7 Toll-Free Phone - Lunarpages provides 24/7 toll-free telephone 1-877-LUNARPAGES (1-877-586-2772) for customers in US/Canada. While United Kingdom customers, can call the toll-free number 0800-072-9150. For customers living outside US/Canada, they still can reach Lunarpages at non toll-free number: 714-521-8150. 24/7 Email support - Lunarpages offers exceptional email support. Their support ticket system allows you to track your problem status and you can always expect to receive their reply promptly. In our experience, their technical staffs are awesome. LunarForums - Lunarpages offers a discussion forum for their existing customers and potential customers like you. If you have any pre-sale questions before signing up with Lunarpages, you can post your queries there. On top of that, you can browse the LunarForums to find the hosting setup or configuration issues, advance assistance on web design, search engine and even basic Perl, CGI, or PHP coding. In general, a web hosting company that is not afraid to provide an open discussion forum is a strong indication that they have nothing to hide and must be very confident about their product and services. Lunarpages Live Chat - If you need to chat online with a support staff, you can make use of Lunarpages 'Live Chat' that can be found at LunarForums. Lunarpages FAQ - You can find helpful tutorials for beginners on various general web hosting topics. Lunarpages Tutorials - Last but not least, this flash media tutorials cover various subjects, including working with CPanel, setting up email client, upload website with FTP, using Dreamweaver MX, Macromedia Flash and Microsoft FrontPage all for free. Reliability is the utmost import criteria in selecting a web hosting company. Lunarpages offers industry leading infrastructure built with the best equipment, including: Dell PowerEdge 2650 servers (equipped with dual Xeon 2.8 GHz processors and 4GB memory), Sun and Cisco Network Devices to ensure maximum performance. As a California web page hosting provider, their four state-of-the-art data centers are located in Los Angeles, Riverside, San Diego and Las Vegas with over 1,500 servers. It provides the highest level of security, safety, redundancy, reliability, scalability and technology. Their BGP4 routed 2 Gigabit fiber network is multi-homed with over 60 carriers, such as, Mzima Networks, NTT/Verio, Global Crossing, Genuity, SBC, Microsoft/MSN, AOL/TimeWarner and Cable & Wireless.
" Your support has been awesome! Your answers are right on the money. I am so glad that I found your company. I will be moving all of my domains and websites here! " " Make this one of these feedback responses that you print out and put on the wall of your office (or cube). I just had to e-mail you guys and let you know that since we've been using your service to host my production company website, we've had NO downtime, never been unavailable...just service that stands, I was with another company before hand and the Tech Support here is far superior to that of that company. You all live up to your word and come through, very nice. " How does Lunarpages measure up? With careful price/quality evaluation, Lunarpages is one of the best quality web hosting providers that we had found. With current special offer $6.95 per month hosting fee, for unlimited of disk space, unlimited of bandwidth and host unlimited number of websites. 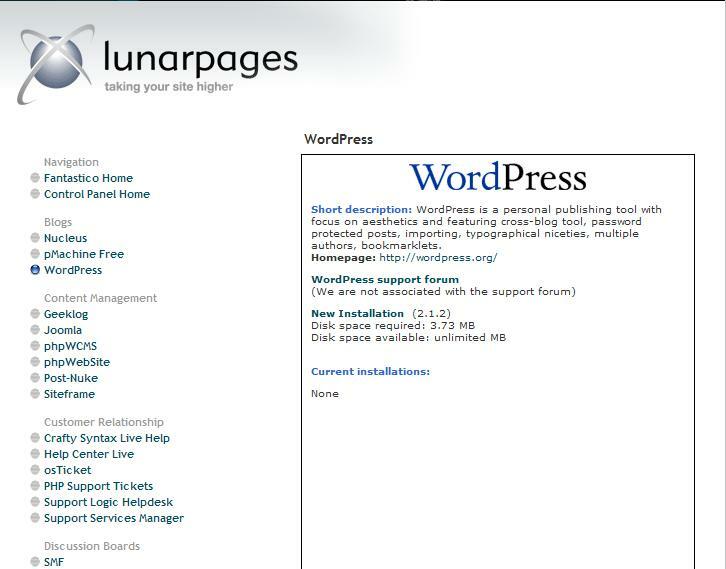 We think Lunarpages's Basic Plan (Personal Website) is an excellent choice for most of the webmasters. If you're looking for a hosting solutions that you can absolutely rely on, backed by a totally committed technical support team, then we would like to recommend that you check out Lunarpages yourself. If you find Lunarpages does not meet your expectation, they offer a risk free 30 day money back guarantee. You have nothing to lose.